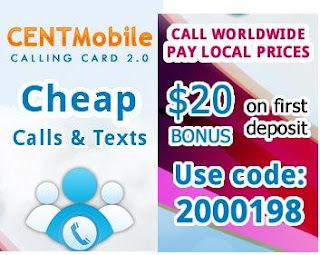 CentMobile Calling Card Review | Free Bonus Code | Free Pc to Phone Calls, Free Voip Calls to India International ! Its been quite sometime we discussed about a calling card, that too which is offering free calls straightaway! Today we will be discussing about Centmobile Calling Card. Many people still prefer calling cards services then the voip apps on their mobile! However as many voip services have entered the market, calling cards also lowered the calling rates to attract new customers. Lets cut it short and get to the point. Centmobile is offering free $1 credit to all new users. You will get $1 credit just on sign up and no credit card is required for signing up. Free $1 credit is worth : Free 66 minutes to India or Free 33 Minutes to Pakistan. This was register with centmobile calling card and make free calls to India. CentMobile. Or Create a Free CentMobile Account. Add a new contact number of a good friend or family member who lives abroad. Call the new Local Centmobile number that was created for your friend’s international number. You can call using your mobile or landline. You will be connected to the international number corresponding to your Local CentMobile number. In future simply call your Local CentMobile number that you have created before. You can use centmobile service to make calls from many countries around the world. CentMobile has more than 2,000 Access Numbers in most parts of the world. A detailed list of CentMobile international calling destinations, is available on the Access Numbers page. Dial the Access Number. Enter destination number. Calls to Pakistan at just 2.14 cents per min. Calls to India at just 1 cents per min. You will get $20 referral bonus. Use code "2000198" to get $20 bonus credit on first deposit. Please note that this is current promotion and may change soon. I got this information from there facebook page. For any more info, visit Centmobile. How does the CentMobile Bonus Code $20 bonus work? When you signup, you will get free $1 credit. Also when you add credit (buy credit), just make sure to enter "2000198" in promo code field. I found this promo code on their facebook page, so you may contact them via facebook. CentMobile did not gime the $20 credit for referring a new customer. I contacted them several times and they did not reply. This action proves that CentMobil referral program is a fraud. I agree on centmovile being fraud. They gave me $20 signing bonus & then took it away later. Then have not been responding to email either. Got $80 from refferals already in Centmobile. Make sure you ask your referrals to enter your code during sign up. Centmobile is dubious and fraudulent. I now see why they don't have a phone contact on their website. My account was recharged without my consent. I contacted them by email, but haven't heard anything from them. I will fight this in court.